Let me start by saying a belated “Happy New Year!”. I know everyone is saying it, but I just really can’t believe that it is 2014 already! I’m excited though, I have a feeling 2014 is going to be an excellent year around here. What did you do on New Year’s Eve? This year we had plans with friends to have an adult dinner (no kids) at our house, but they were sick and couldn’t make it. We were sad they couldn’t join us, but that didn’t stop us from cooking up the feast I had been preparing for two days. So, think restaurant-quality, favorite gourmet steakhouse meal, and that was pretty much our NYE dinner. Seriously, it was just that good. 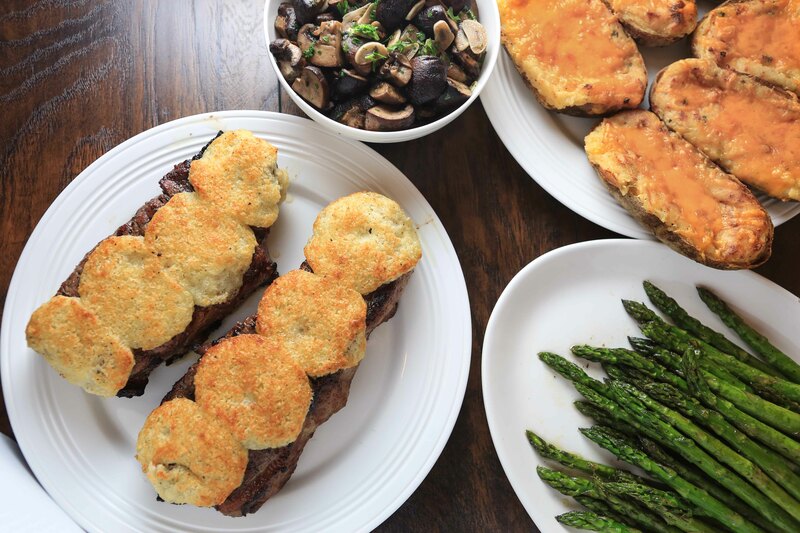 This recipe for parmesan crusted new york strip steak was inspired by one of our favorite steak houses in Atlanta, called Wildfire. That restaurant used to be one of our regular date-night spots where we could always enjoy a great meal. 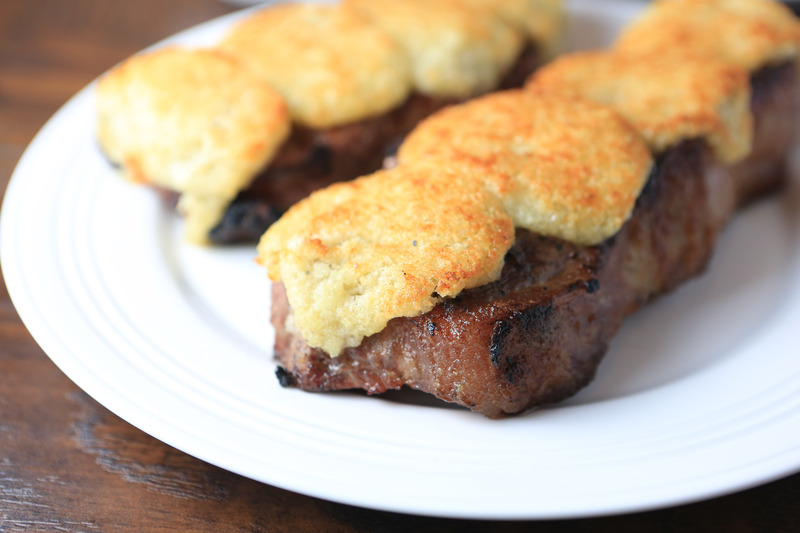 They specialized in delicious steaks, and featured a variety of crusts that you could order on top of your steak. Andrew just reminded me that we had tried most of the other crust varieties, such as the horseradish crust, mushroom crust, and even the blue cheese crust, but nothing came close to the goodness of the parmesan crust. And so, with a little brainstorming, research, and experimentation, I present to you parmesan crusted new york strip steak. 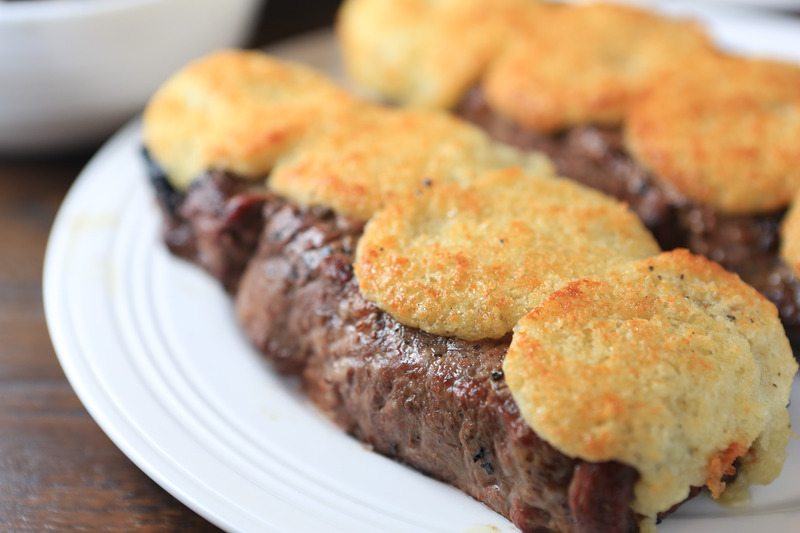 I mean, who wouldn’t love a tender, juicy, grilled steak with a cheesy, crispy crust seared on top? Amazing! In a small mixing bowl, mash butter with a fork. Then add bread crumbs, parmesan, garlic and salt and pepper and smash together until well combined. Once ready, slice log in half. Then cut each half in half again. And finally, cut each quarter in half one more time. You should end up with 8 even slices. Once you have grilled your steaks, place 4 of the crust slices on top of each steak. Place steak in an oven safe pan, and broil for 2-3 minutes until crust is brown. I love Trader Joe’s Imported Grated Parmesan Cheese. It has the perfect consistency and flavor for this recipe, and at a great price.